Orthodox Christians affirm that Orthodoxy is the True Faith: That the Orthodox Church is the True Church. Many heterodox Christians are offended by the exclusivity of such a claim. I suggest that they are offended because they think we mean by such a claim what they would mean if they made a similar claim. I do not think we do. Of course, among Orthodox Christians there exists a range of opinion as to what exactly “True Church” implies. There are a few who argue with the zeal of 17th century Puritans that those outside the Orthodox Church do not have the Holy Spirit and are hopelessly deluded. You can find their message all over the Internet. Thank God this is a small minority. There are some who argue with almost no zeal at all (in my experience) that the differences between the churches are merely qualitative. The Orthodox Church is the best, but they lose no sleep over their children marrying a Catholic or an Anglican and raising their grandchildren in those traditions. For my own part, I like to say that we Orthodox know where the Church is, but we do not know where it is not. That is, I know that the teaching of the Orthodox Church, its Mysteries, its structure, canons, and its spiritual life are true. I don’t know about the Anglicans. I don’t know about the Catholics. I know that many, many aspects of Anglican Church and the Catholic Church are similar–apparently the same–as the Orthodox Church, especially the Orthodox Church of the pre-schism West. On the other hand, I know that there are several matters that are not the same. Some of those matters are, from an Orthodox perspective, matters of heresy and manifest serious perversions of the Church. HOWEVER (and it is a big however), I do not know what constitutes “not church.” There have been times when Orthodox bishops have given permission (economia) in emergency situations (i.e. battlefields, etc.) for Orthodox Christians to receive the Eucharist from Roman Catholic priests. Certainly the Orthodox Church recognizes the marriages and baptisms of Catholics and Anglicans (well, recently Anglicans have become a little spotty. You can never tell if the priest(ess) actually baptized in the Name of the Father, Son and Holy Spirit or in the name of the Parent, Lover and Friend). 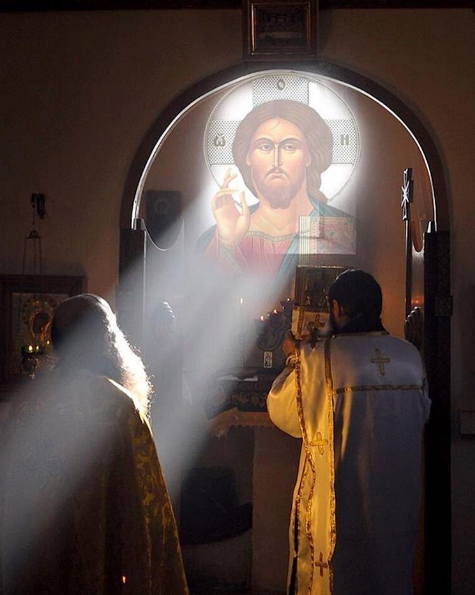 But my point is this, while I can say easily that the Orthodox Church is the True Church, the True Faith; I cannot so easily say that what is not Orthodox is therefore not Church–although some Orthodox Christian can easily say it. I cannot. It seems to me that God has revealed what the Church is, but it takes (at least) a series of Ecumenical Councils to determine what the Church is not. For me it is somewhat like saying the only true human being is Jesus Christ. Those who sin are somehow less than human, but they are not nonhuman beings. Something remains even though something has been lost. I am particularly nervous when Orthodox Christians begin to apply Aristotelean logic to their faith. What I mean is that I understand how a non-Orthodox Christian could argue, “Either, or, if, then, and therefore.” This is how western Christianity became what it is today (a mess of 25,000 denominations). Noetic apprehension and mystical contemplation have been almost completely lost in the West. So western Christians use what they have. But for an Orthodox Christian to apply such mathematical logic to matters of Mystery seems to me to be a colossal failure. Knowing what the Church is does not “logically” lead us to what the Church is not. “The Wind blows where it will,” Jesus said, “you hear the sound of it, but you do not know where it comes from or where it is going.” I know/know of very Christian men and women who are not Orthodox, yet the “sound” of the Holy Spirit in their lives is so loud that I am almost ashamed to call myself a Christian in comparison. I can criticize aspects of their faith and practice and certainly point out that they are not Orthodox, but to say that they are not somehow part of the Body of Christ, the Church, I cannot say. There is no “mystical church” in the Protestant sense–no church made up of all real believers regardless of their affiliation. The Church is historical. It is in time and space. It is identifiable. However, history is messy. St. Isaac the Syrian was a member of the heretical Nestorian Church. There must have been enough “Church,” enough of an echo of the Orthodox Faith in the heterodox Nestorian Church to produce such a saint. Then there is the famous example of a prayer attributed to St. Philaret of Moscow that begins,”Lord, grant me to greet the coming day in peace.” Fr. Thomas Hopko has discovered that this prayer was originally written by a Roman Catholic bishop in France, François Fénelon, and popularized in Russia by St. Philaret. Again, there must have been enough “Church” in the heterodox Latin Church of France in the 18th century to produce such a man who could write such a prayer, a prayer offered by millions of Orthodox Christians daily. I am not saying that a heterodox group is the True Church because it produces a true saint. What I am saying is that even within heterodox Christian assemblies, there remains something of the True Church. How much remains, how Grace functions in it, what does or doesn’t take place in their sacraments, I do not know. Like I said, I don’t know what the Church isn’t.